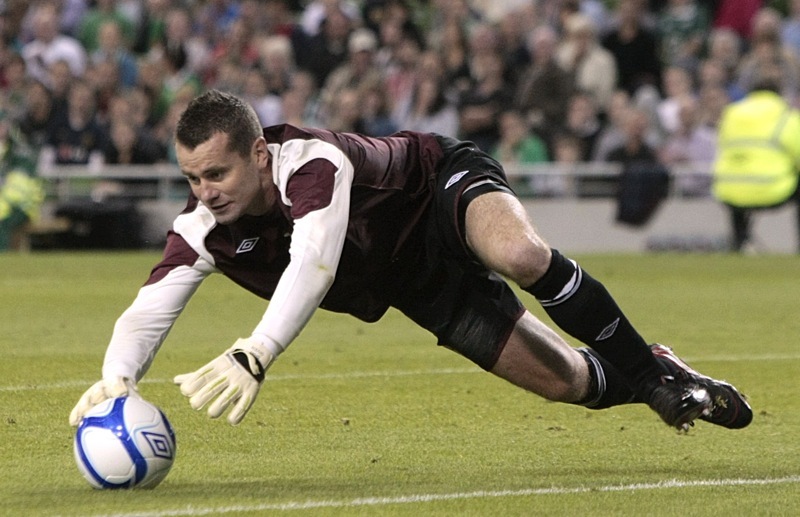 Why Would Man City Allow Shay Given To Join Rivals Arsenal? The majority of football rumourmongs seem certain that Shay Given will join Arsenal from Man City this week, probably on loan. Arsenal crave a top-class goalkeeper, but why the hell would Roberto Mancini want to strengthen the team of a title rival and simultaneously weaken his own squad (especially after he had a goalkeeping mini-crisis last season)? Answer: he doesn’t want to ditch Given (he’s not stupid) and is bent on keeping the Irishman happy somehow, firstly by picking him for City’s Europa League tie at Timisoara on Thursday. City have at least two top-class players for every position, including at keeper, but of course I understand why Given – who went to City to revitalise his career – must be frustrated, and no less so after sitting in the stands and watching Joe Hart repel all invaders at White Hart Lane on Saturday lunchtime; Hart is the current No.1 at City, and rightly so. I suspect Mancini will convince Given to stay, which opens the door for Mark Schwarzer at Fulham to get his dream move to the Emirates – if nasty boss Mark Hughes allows it. I don’t think there’s much to choose between the two. Gooners, who would you rather have in goal? i’d much rather have given to schwarzer. i do like schwarzer but he’s a bit older, and at his peak was never as good as given has been at his best. really i’d rather have lloris or someone like that but our transfer policy clearly states that before we spend big, we must first scrape the bargain bins for some reason. I’d much rather have either of them, over the hacks we have. Almunia had a classic Flappyhandski moment yesterday where he totally miss judged the corner and clattered into Kolchieny. That’s the type of moments we’ve become used to seeing these days! The problem with our team “Gunners” is not goalkeepers I think if we can build a sold defense everything will be fine. So instead of buying goalkeeper it’s better Arsen Wenger save that cash for another two strong defenders before transfer window closed …lol..
tbh i would rather have shay given, but beggars can’t be choosers, and if we get one or the other, all us arsenal fans would be more than happy. transfer deadline day will come, and we’re bound to make a signing then. Personally I would thank Shay for a great year then let him choose where to go. This is mostly out of respect but also because he doesn’t command his box too well and also is prone to misjudging the odd cross because of his size. That said, he is an outstanding shot stopper and would be a great buy or loan signing for any team. Why do people not seem to remember that we sold ADEBAYOR and KOLO TOURE, to man city our rivals, and they are what could be argued some of our BEST players… it is very possible that we have a good rapport with man city, and they shouldn’t hesitate to repay us a favor by allowing shay given to come to arsenal. We need someone solid in goal if we are going to win anything this season, and if we get given, this will allow the perfect amount of time for our young polish keeper szczesncy to step up to first team. I hope we sign Given. At 34 he’s probably got 2/3 years left as a very good keeper, and by the time he’s in decline Wojciech Szczęsny will be ready to make the step up to the first team. I like Mark Schwarzer, but he’s 37 now and almost certainly past his best at this point in his career. He’d only be a marginal improvement over what we already have at the club I think. You obviously believe Shay Given to be a has-been imbecile if you expect him to remain on the bench at Man City for the coming season. This guy is a World-Class Goalkeeper with bags of experience who, at 34 years old, is in his goalkeeping prime. Why oh why would he ever stay at Man City? You might say for the money but money does not matter to a man of Shay’s character, first team football does. Given will leave Man City by the end of the transfer window. Anybody who knows anything about football knows this. This is the last time I read this pathetic website. Given will go to Celtic because he is a massive tim, doesnt want to sit the bench at city, and city wont allow him to go to a competitor. Isn’t it the case that on September 1st clubs have to announce their 25 man squads going forward and currently Man City have something like 32 first-team players on their books. They might be looking at which players they can afford to lose and get deals done quickly for. If Arsenal have an offer on the table for Given then it is probably a more viable option than keeping him and trying to drum up business for another player in a short space of time. P.S. I like Schwarzer but Given is the better keeper, far more consistent! No8 makes a good point, we sold 2 of our good players at the time. I’m sure a loan deal wouldn’t be asking too much of him would it? Shay Given is world class, pay City what they want and get him Arsene. stop fannying around with them 2 gobshites we currently have and get us Given!!! Given due to his age, Sch might have a better price tag though. We all know that Wenger is the king of a bargain basement deal so I wouldn’t doubt the cheaper alternative. If he doesn’t pick up one or the other and another decently rated CB, I’ll have serious questions about our ability to compete this year. 2 weeks Wenger, the clock is ticking. Given’s well…a given. Obviously Schwarz would be a fantastic addition to the army of keepers we have at the moment. Almunia has been a good keeper in the past but with the possibilities of these 2 I think it’s time to hand over the gloves. As far Fabianksi, I’ll keep faith in the lad, I think he has the potential, just needs time. David De Gea .. He is young and talented. I think City will wait until Arsenal’s deal for Schwarzer is complete, then loan Given to Fulham. Unlucky for the lad Stockdale who looks like a good propsect. Given would be amazing, I would easily pay double for him compared to Schwarzer. It is simple, Arsenal are one of the best four teams in England and Given is one of the best four keepers in the EPL. A team of Arsenal’s global stature, especially with the positive financial state the club is in shouldn’t even be considering players on the level of quality of Schwarzer. Unfortunately, Wenger hasn’t learned anything in the last five years. Besides City, the top teams in England didn’t do much buying. If we spent 20-25mil on a keeper + a defender or two of top shelf talent, we would be scaring rivals. Even with such an opportunity like Shay Given being available, Wenger will opt for the cheaper/older/worse Schwarzer. Arsenal won’t win silverware this year AGAIN and Cesc will leave. Either keeper would be a instrumental upgrade from the crap options we have now, but I would rather have Given. Too bad it is only a wish though, just like wishing the most profitable club in the Premiership would go after world class talent. Bargain buying is great, but sometimes the cash needs to be splashed on world class players. We should have the likes of Neuer, Adler, Akinfeev, or Lloris in goal but Arsenal have become so cheap that they are going to make fans of the club happy with the signing of a good-at-best 37 year old keeper from Fulham. Schwarzer is no better then Almunia, FACT!! Almunia would look good at Fulham too where making one decent save a game is enough to get praise. If Schwarzer comes in we’ll all be talking about buying a new keeper in the January transfer window. Beter the devil u know! I am one of the few who thinks we are fine we Almunia and maybe select No.2 from the other 2 and send Fabianski on loan. The two, Almunia & Given, dont compare but completely different. Yes Shay might be seen as the only answer for now, since we all the time look for silly mistakes Almunia can be exposed, but does that mean we wont hve team scoring us anymore! Adding on defence can get my yes vote and that can shape us to be solid in defending. Schwarzer or Given will be prune to silly mistakes. Are we gonna blame them and start looking for a replacement AGAIN!